Azure | Richard M. Hicks Consulting, Inc.
Windows 10 Always On VPN is designed to be implemented and managed using a Mobile Device Management (MDM) platform such as Microsoft Intune. With Intune specifically, there is an option to configure an Always On VPN profile in the UI. However, it provides only limited support and does not include all settings and options required for many deployments. 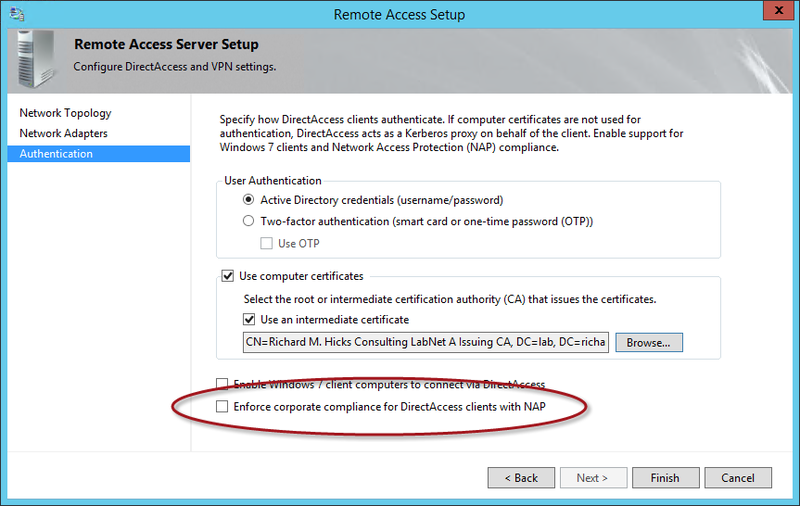 Crucially, IKEv2 advanced security settings cannot be configured using the Intune portal. Also, there is currently no option for configuring a device tunnel with Intune. In these scenarios the administrator must manually create a ProfileXML file and provision it using Intune, System Center Configuration Manager (SCCM), or PowerShell. ProfileXML includes all settings that define the Always On VPN connection. The options and settings available are documented in the VPNv2 Configuration Service Provider (CSP) reference on Microsoft’s web site. ProfileXML is formatted using elements and settings within those elements. The formatting and syntax are critical to ensuring proper operation. Any error in syntax or formatting can result in an error, such as those described here. Formatting is also important for readability, which is often helpful when reviewing configuration settings or troubleshooting syntax errors. For example, an element may be defined correctly but may be nested wrong. Often XML files are created with all text being left-justified, or with everything on a single line, making the content difficult to read. Using a file editor that recognizes XML files can be beneficial. To create, edit, and review ProfileXML it is recommended that a proper editing tool be used. I recommend using Microsoft’s Visual Studio Code. It is free, and it is especially helpful when editing XML files. Visual Studio Code can be downloaded here. To further enhance Visual Studio Code’s XML editing and formatting capabilities I recommend installing the XML Tools plug-in. This tool extends the native features of VS code for handling XML files. One important thing it adds is a formatting feature that will make your ProfileXML much easier to manage. The XML Tools plug-in for VS Code can be downloaded here. Once the XML Tools plug-in for VS code has been installed, formatting XML for readability is straightforward. Simply right-click anywhere in the document and choose Format Document. Once complete, the XML document will be formatted with proper indenting and nesting of elements, as shown here. Formatting and syntax must be strictly adhered to when creating a ProfileXML file for Windows 10 Always On VPN. 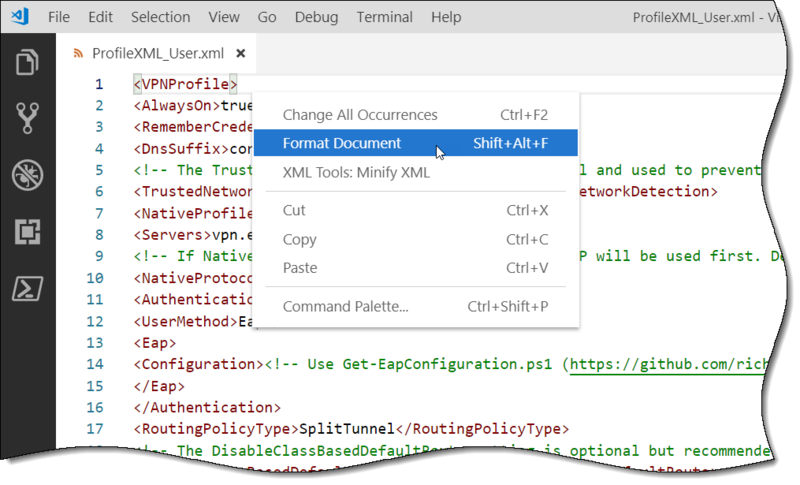 Using Visual Studio Code with the XML Tools plug-in allow the administrator to create and edit XML with proper formatting, which greatly improves readability and allows for streamlined configuration review and troubleshooting. Eliminating single points of failure is crucial to ensuring the highest levels of availability for any remote access solution. For Windows 10 Always On VPN deployments, the Windows Server 2016 Routing and Remote Access Service (RRAS) and Network Policy Server (NPS) servers can be load balanced to provide redundancy and high availability within a single datacenter. Additional RRAS and NPS servers can be deployed in another datacenter or in Azure to provide geographic redundancy if one datacenter is unavailable, or to provide access to VPN servers based on the location of the client. Unlike DirectAccess, Windows 10 Always On VPN does not natively include support for multisite. 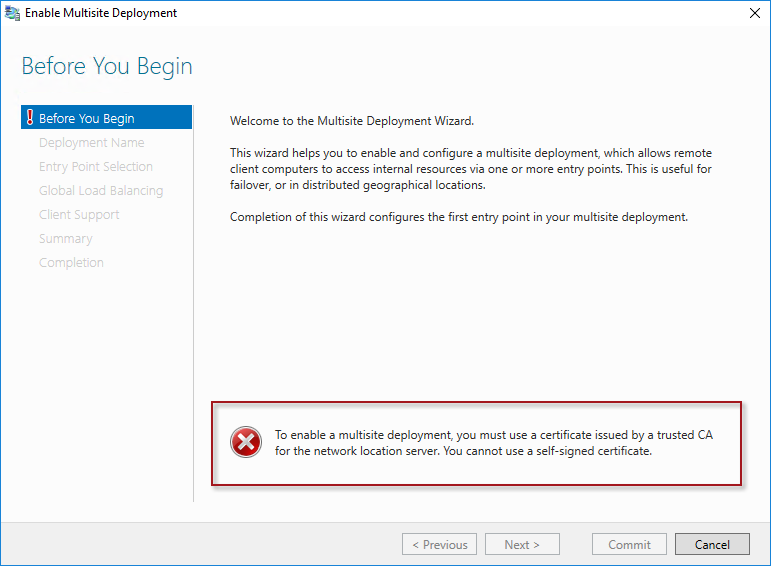 However, enabling multisite geographic redundancy can be implemented using Azure Traffic Manager. Traffic Manager is part of Microsoft’s Azure public cloud solution. It provides Global Server Load Balancing (GSLB) functionality by resolving DNS queries for the VPN public hostname to an IP address of the most optimal VPN server. Using Azure Traffic manager has some benefits, but it is not with some drawbacks. Advantages – Azure Traffic Manager is easy to configure and use. It requires no proprietary hardware to procure, manage, and support. Disadvantages – Azure Traffic Manager offers only limited health check options. Azure Traffic Manager’s HTTPS health check only accepts HTTP 200 OK responses as valid. Most TLS-based VPNs will respond with an HTTP 401 Unauthorized, which Azure Traffic Manager considers “degraded”. The only option for endpoint monitoring is a simple TCP connection to port 443, which is a less accurate indicator of endpoint availability. Note: This scenario assumes that RRAS with Secure Socket Tunneling Protocol (SSTP) or another third-party TLS-based VPN server is in use. If IKEv2 is to be supported exclusively, it will still be necessary to publish an HTTP or HTTPS-based service for Azure Traffic Manager to monitor site availability. Azure Traffic Manager provide four different methods for routing traffic. Priority – Select this option to provide active/passive failover. A primary VPN server is defined to which all traffic is routed. If the primary server is unavailable, traffic will be routed to another backup server. Weighted – Select this option to provide active/active failover. Traffic is routed to all VPN servers equally, or unequally if desired. The administrator defines the percentage of traffic routed to each server. Performance – Select this option to route traffic to the VPN server with the lowest latency. This ensures VPN clients connect to the server that responds the quickest. Geographic – Select this option to route traffic to a VPN server based on the VPN client’s physical location. Open the Azure management portal and follow the steps below to configure Azure Traffic Manager for multisite Windows 10 Always On VPN. Enter a unique name for the Traffic Manager profile. Select an appropriate routing method (described above). Create or select a resource group. Select a resource group location. Important Note: The name of the Traffic Manager profile cannot be used by VPN clients to connect to the VPN server, since a TLS certificate cannot be obtained for the trafficmanager.net domain. Instead, create a CNAME DNS record that points to the Traffic Manager FQDN and ensure that name matches the subject or a Subject Alternative Name (SAN) entry on the VPN server’s TLS and/or IKEv2 certificates. Open the newly created Traffic Manager profile and perform the following tasks to enable endpoint monitoring. Select TCP from the Protocol drop-down list. Enter 443 in the Port field. Update any additional settings, such as DNS TTL, probing interval, tolerated number of failures, and probe timeout, as required. 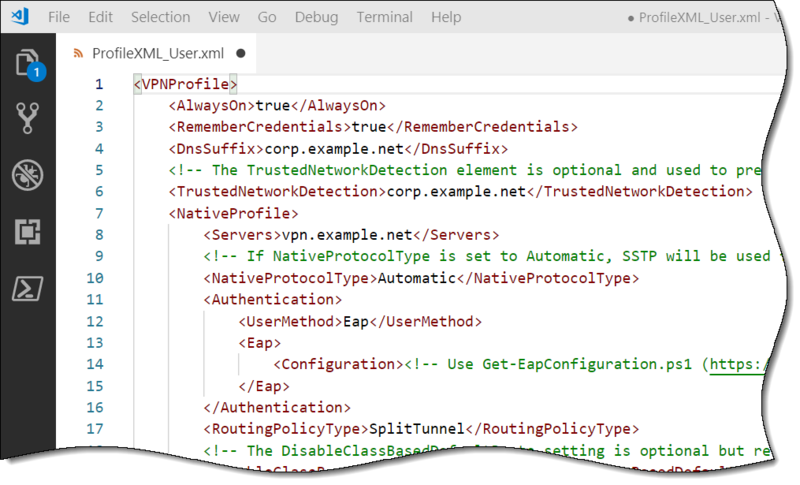 Follow the steps below to add VPN endpoints to the Traffic Manager profile. Select External Endpoint from the Type drop-down list. Enter a descriptive name for the endpoint. Enter the Fully Qualified Domain Name (FQDN) or the IP address of the first VPN server. Select a geography from the Location drop-down list. Repeat the steps above for any additional datacenters where VPN servers are deployed. Implementing multisite by placing VPN servers is multiple physical locations will ensure that VPN connections can be established successfully even when an entire datacenter is offline. In addition, active/active scenarios can be implemented, where VPN client connections can be routed to the most optimal datacenter based on a variety of parameters, including current server load or the client’s current location. One of the many advantages NetMotion Mobility offers is that it requires no proprietary hardware to deliver its advanced capabilities and performance. It is a software solution that can be installed on any physical or virtual Windows server. This provides great deployment flexibility by allowing administrators to deploy this remote access solution on their existing virtual infrastructure, which is much less costly than investing in dedicated hardware or virtual appliances. As customers begin moving their traditional on-premises infrastructure to the cloud, it’s good to know that NetMotion Mobility is fully supported in popular public cloud platforms such as Microsoft Azure. Installing and configuring Mobility on a server in Azure requires a few important changes to a standard Azure VM deployment however. Below is detailed guidance for installing and configuring NetMotion Mobility on a Windows Server 2016 virtual machine hosted in the Microsoft Azure public cloud. Before installing the NetMotion Mobility software, follow the steps below to configure the Azure VM with a static public IP address and enable IP forwarding on the internal network interface. In the Azure management portal, select the NetMotion Mobility virtual machine and click Networking. Click on the public-facing network interface. In the Settings section click IP configurations. In the IP configurations section click on the IP configuration for the network interface. In the Public IP address setting section click Enabled for the Public IP address. Click Configure required settings for the IP address. Enter a descriptive name and select Static as the assignment method. Click Save. Note: The process of saving the network interface configuration takes a few minutes. Be patient! Note the public IP address, as this will be used later during the Mobility configuration. Close the IP address configuration blade. In the IP forwarding settings section click Enabled for IP forwarding. Proceed with the installation of NetMotion Mobility. When prompted for the external address, enter the public IP address created previously. Next choose the option to Use pool of virtual IP addresses. Click Add and enter the starting and ending IP addresses, subnet prefix length, and default gateway and click OK. Complete the remaining NetMotion Mobility configuration as required. A user defined routing table must be configured to ensure that NetMotion Mobility client traffic is routed correctly in Azure. Follow the steps below to complete the configuration. In the Azure management portal click New. In the Search the Marketplace field enter route table. In the results section click Route table. Enter a descriptive name and select a subscription, resource group, and location. Once the deployment has completed successfully, click Go to resource in the notifications list. Follow the steps below to add a route to the route table. In the Settings sections click Routes. In the Address prefix field enter the subnet used by mobility clients defined earlier. Select Virtual appliance as the Next hop type. Enter the IP address of the NetMotion Mobility server’s internal network interface. Click Choose a virtual network and select the network where the NetMotion Mobility gateway resides. Click Choose a subnet and select the subnet where the NetMotion Mobility gateway’s internal network interface resides. Note: If clients connecting to the NetMotion Mobility server need to access resources on-premises via a site-to-site gateway, be sure to associate the route table with the Azure gateway subnet. A network security group must be configured to allow inbound UDP port 5008 to allow external clients to reach the NetMotion Mobility gateway server. Follow the steps below to create and assign a network security group. In the Search the Marketplace field enter network security group. In the results section click Network security group. Follow the steps below to configure the network security group. In the Settings section click Inbound security rules. Enter 5008 in the Destination port ranges field. Select UDP for the protocol. Select Allow for the action. Select the external network interface of the NetMotion Mobility gateway server. After completing the steps above, install the client software and configure it to use the static public IP address created previously. Alternatively, configure a DNS record to point to the public IP address and specify the Fully Qualified Domain Name (FQDN) instead of the IP address itself. I’m pleased to announce I will be delivering Windows 10 Always On VPN hands-on training classes in various locations around the U.S. this year. As Microsoft continues to move away from DirectAccess in favor of Windows 10 Always On VPN, many organizations now must come up to speed on this new technology. Spoiler alert…it’s not trivial to implement! There’s lots of moving parts, critical infrastructure dependencies, and many configuration options to choose from. 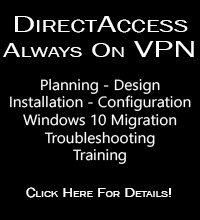 Additionally, Windows 10 Always On VPN is managed in a completely different way than DirectAccess, which is sure to present its own unique challenges. Reservations are being accepted immediately for classes held on March 27-29, 2018 in Southern California and April 10-12 in Chicago. The cost for this 3 day hands-on, in-depth training class is $4995.00 USD. Later this year I’ll be delivering classes in other parts of the country as well. Those locations will be chosen based on demand, so if you can’t make this first class, please register anyway and let me know your location preference. If there’s enough interest in a specific locale I will schedule a class for that region soon. Although I currently have no plans to deliver my training classes outside the U.S., I’m more than happy to consider it if there is enough demand, so let me know! Reservations are being accepted now! The cost for this 3-day hands-on training class is $4995.00 USD. Space is limited, so don’t wait to register! Fill out the form below to save your seat now. I’m really excited to announce that I have once again been invited to speak at the upcoming TechMentor event in Redmond, WA August 7-11, 2017! 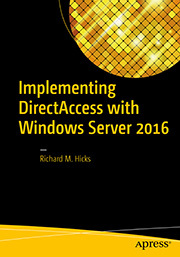 This year I’ll be presenting two important deep-dive training sessions on DirectAccess. The first is a three-hour course on implementing DirectAccess using Windows Server 2016. This session will cover infrastructure prerequisites as well as tips, tricks, and best practices for implementing DirectAccess using Windows Server 2016. In addition I will also be delivering a three-hour deep dive on DirectAccess troubleshooting. 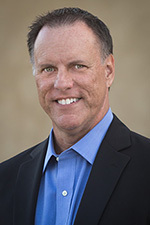 In this session, I’ll share valuable insight, tools, and techniques for quickly identifying and resolving many common DirectAccess connectivity and performance issues. In addition I will also be giving a short talk on getting started with Azure site-to-site networking. If you want to take advantage of the power and flexibility that the Azure public cloud has to offer, extending your on-premises datacenter using site-to-site VPN is essential. Register today using code TMSPK05 and save! 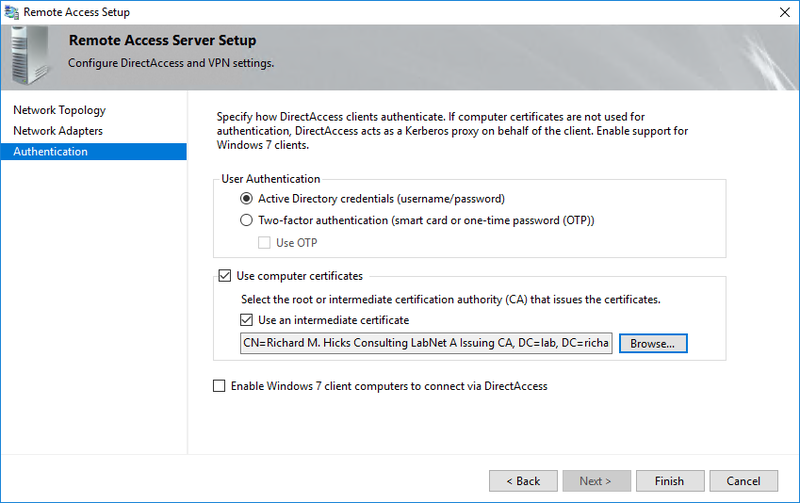 DirectAccess can be configured to enforce strong user authentication using smart cards or one-time passwords (OTP). This provides the highest level of assurance for remote users connecting to the internal network via DirectAccess. OTP solutions are commonly used because they require less administration and are more cost effective than typical smart card implementations. Most OTP solutions will integrate with DirectAccess as long as they support Remote Access Dial-In User Service (RADIUS). Azure Multifactor Authentication (MFA) is a popular OTP provider used to enable strong user authentication for a variety of platforms, including web sites and client-based VPN. Unfortunately, it doesn’t work with DirectAccess. This is because Azure MFA uses a challenge/response method for which DirectAccess does not support. To use OTP with DirectAccess, the user must be able to enter their PIN and OTP immediately when prompted. There is no provision to begin the authentication process and wait for a response from the OTP provider. An excellent alternative to Azure MFA is PointSharp ID. PointSharp is a powerful OTP platform that integrates easily with DirectAccess. It is also very flexible, allowing for more complex authentication schemes for those workloads that support it, such as Exchange and Skype for Business. You can download a fully-functional trial version of PointSharp ID here (registration required). The PointSharp ID and DirectAccess integration guide with detailed step-by-step instructions for configuring DirectAccess and PointSharp ID can be downloaded here. Consulting services are also available to assist with integrating PointSharp ID with DirectAccess, VPN, Exchange, Skype for Business, Remote Desktop Services, or any other solution that requires strong user authentication. More information about consulting services can be found here. Microsoft has historically not supported DirectAccess running on Windows Server in the Microsoft Azure public cloud. In the past, this was due to limitations imposed by the underlying cloud infrastructure, as I documented here. When Microsoft moved from the old service manager model (classic) to the newer resource manager infrastructure, many of the issues that prevented the DirectAccess workload from being stable were resolved. There are still some fundamental limitations to deploying DirectAccess in Azure as I documented here, but for the most part it was a workable solution. In fact, Microsoft even updated their support statement for DirectAccess on Azure, quietly removing it from the unsupported roles list in July 2016. Sadly, Microsoft has reversed their decision on the support of DirectAccess in Azure. 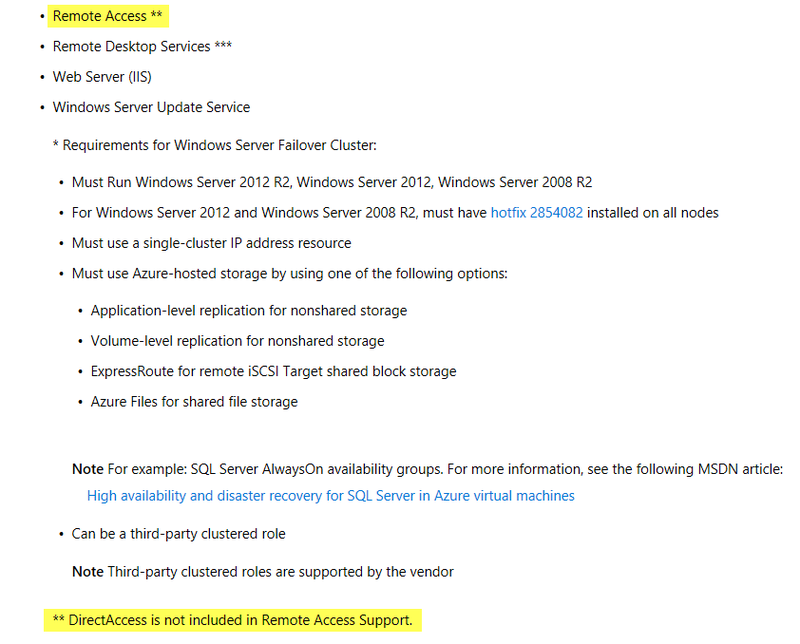 As many of you have noticed or commented on some of my posts, Microsoft recently added clarification on support for remote access on Windows Server in Azure, explicitly indicating that DirectAccess was not included in Remote Access support. You’ll be glad to know that DirectAccess is indeed supported in Amazon’s public cloud infrastructure, Amazon Web Services (AWS). I’ll be drafting some guidance for deploying DirectAccess in AWS soon. Stay tuned! I am pleased to announce that I’ll be participating in the upcoming TechMentor conference in Orlando, FL in December. The TechMentor conference is part of the larger Live!360 event and offers a compelling agenda of training for IT professionals. I’ll be delivering the following sessions that are focused on providing secure remote access using Windows Server 2016. Don’t miss out on this outstanding conference. Register today and save $500.00!